On September 2, 1991, workers at Almaraz Unit 2 in Spain were using an underwater cutting tool to modify equipment in the water-filled pool used to store irradiated fuel assemblies after their removal from the reactor core. The spent fuel pool is a large pit made of reinforced concrete. It is lined with stainless steel to prevent radioactive water from leaking through cracks, seams, and pores in the concrete. A gap in the insulation on the power cable to the cutting tool caused arcing between the cable and the spent fuel pool’s liner. The arc, essentially underwater lightning strikes, burned a hole through the pool’s thin liner. Water leaked from the spent fuel pool through the hole at a rate of about six gallons per minute. Operators periodically added water to the spent fuel pool to keep its level within the normal range until the hole could be patched.Had the leak rate been greater or if workers had not been able to compensate for the water loss, the level in the spent fuel pool might have dropped to the point where irradiated fuel assemblies over-heated and melted or caught on fire. 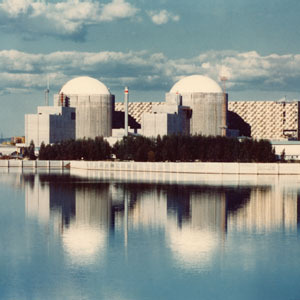 The design basis event for spent fuel pools at U.S. nuclear power plants (i.e., the postulated scenario that the plant’s safety equipment and procedures are developed to protect workers and the public from) involves a fuel handling accident. For example, containment integrity and filtration systems that process air before releasing it to the atmosphere are required when irradiated fuel is being moved. But when such fuel movements cease, the filtration systems can legally be turned off and the containment door opened wide. As this near-miss at Almarez demonstrated, there are events that can occur when irradiated fuel is not being moved that can lead to fuel damage and the release of radioactivity. In other words, protection against releases of radioactivity from spent fuel is a 24/7 proposal, not the infrequent protection Americans now receive. And, as the next three Fission Stories will reveal, it certainly can happen here.